I've been waiting for Team BHP official review ever since the day facelifted Aspire was launched. A good package of features and is correctly priced. 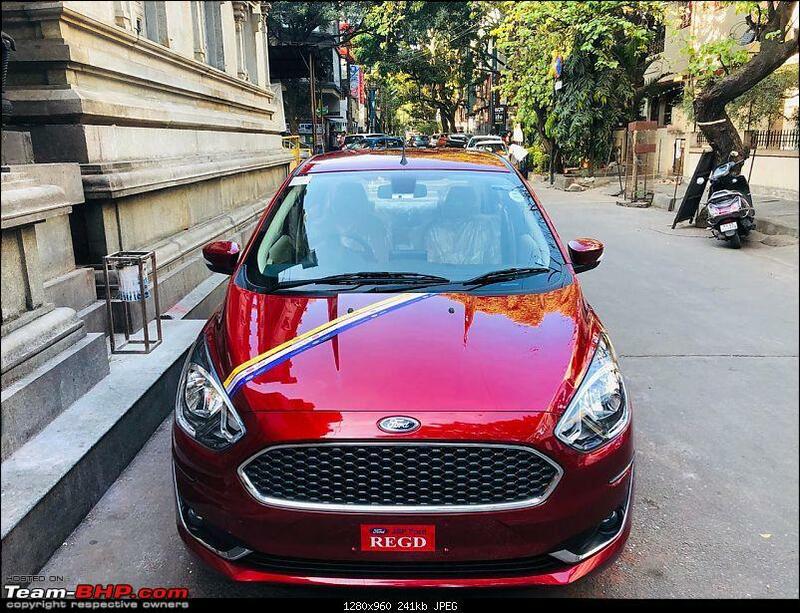 It is a better car than Dzire, Xcent and is neck to neck with Amaze. In terms of safety, Titanium+ Aspire is the clear winner. Yet people don't seem to be interested in Aspire. Sales figures of just 2000 cars/month is a proof of this. I read a line in the review that build quality has gone down. Can anyone please tell me how? What is the difference that made it go down? On an unrelated note, when can we expect Global NCAP ratings of Freestyle? 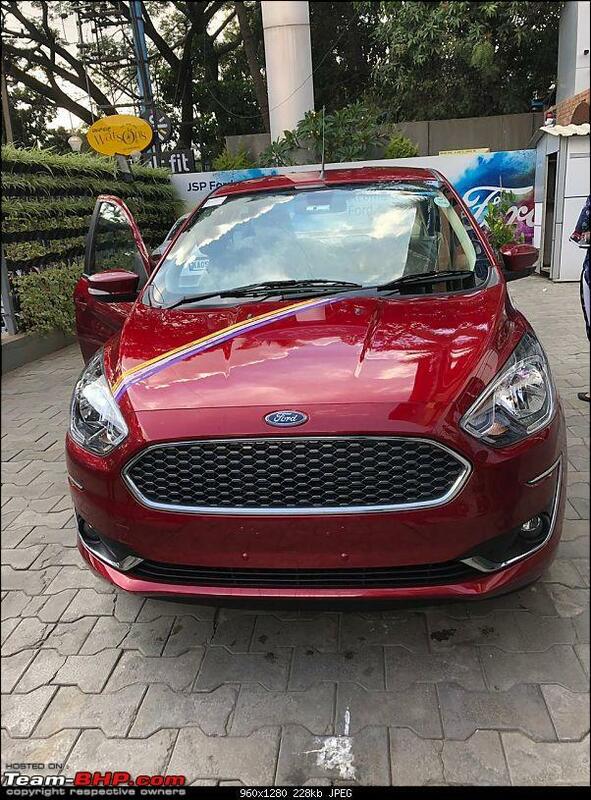 While I appreciate Ford for this facelift and planning to book early next year, I am disappointed that Traction control system+ Electronic stability control of Freestyle didn't make it to Aspire. Is there any way to retrofit TCS+ ESC of Freestyle in Aspire? Any experts here, please help. Ford India, if you are listening, kindly provide TCS+ESC in Titanium+ or atleast as an accessory like 'Safety pack' of Ford UK. Great review Blackwasp and GTO! Even when the Figo twins were launched in 2015, the feature set was barely enough. 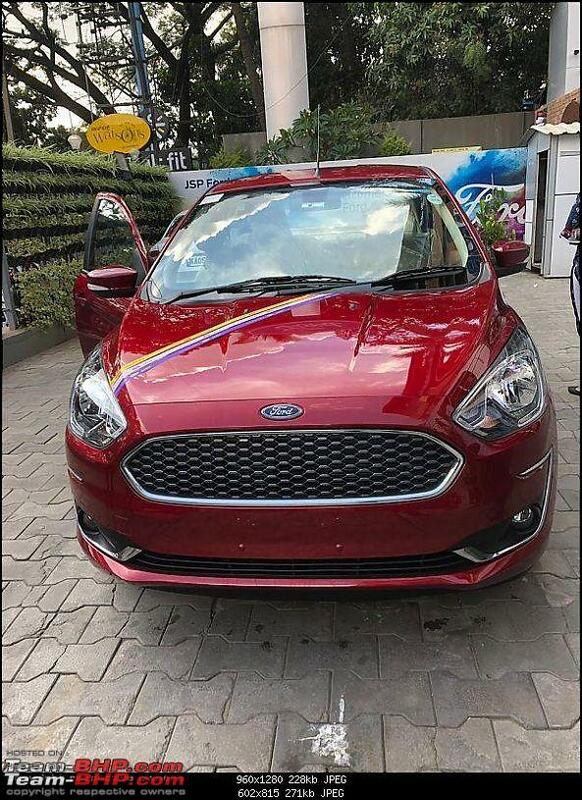 And even now, they seem to be playing catch up when it comes to features.That being said, the presence of 6 airbags is truly unique to the Fords. I have been hearing a lot of praises about the new dragon engine when compared to the previous 1.2. 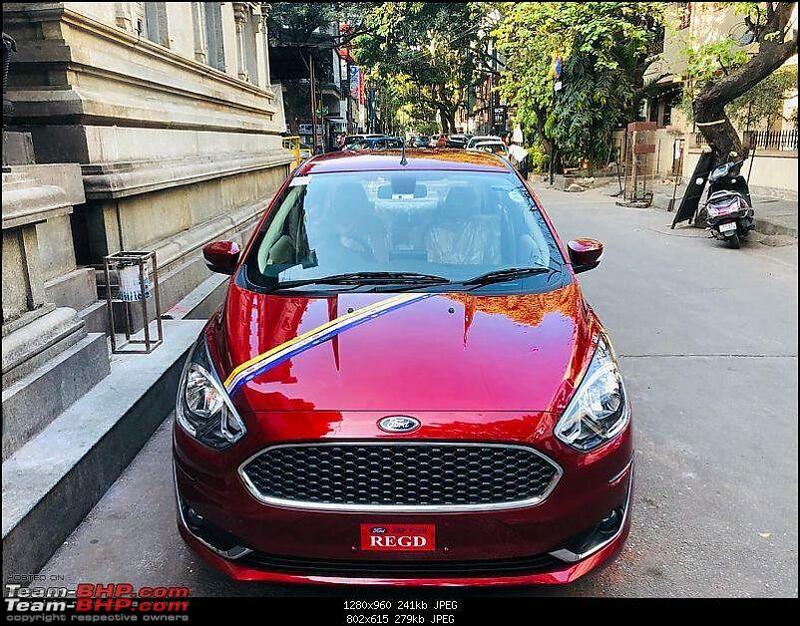 While it may not be as good as Marutis K12(with the weight factor further helping Maruti), I would like to know in what way is the new 1.2 Dragon not as good as the Hyundais 1.2 as mentioned? Is it only refinement? Or is it taking into account all the factors? I have driven the 1.2 Kappa in the Grand i10, the Xcent and the i20. While the engine felt decent in the i10, acceptable in the Xcent, it felt absolutely dead in the i20. If this engine fares worse than the 1.2 Kappa, then I feel it is nothing short of a disappointment for me. Thread moved from the Assembly Line to Official Reviews. Thanks for sharing, Kanad! I enjoyed doing this review with you. Love Sync3 and it’s by far the best head-unit in the segment. I like this attention to detail. Despite my iTunes / Rocket Player using the album’s image, Sync3 shows the actual artist which I think is waaaaaaaaaaaaaay cooler & so much more relevant . It’s nice to put a face to the voice you're listening to. Sync 3 has a GraceNote integrated Database which has most artists images and can even correct the song details if it recognises the song. I love that feature in my Freestyle. The database will supposedly get updated when there is a Sync 3 software update via WiFi. I have a freestyle petrol titanium with 1.2 ltr dragon petrol engine which I have driven for more than 5.5 K km so far. And I have driven both i10 and i20. So I guess I am in a position to answer your query. The 1.2 ltr dragon petrol from ford is definitely peppier than i20's 1.2 ltr kappa engine. Yes, there is lack of refinement, but again that's felt only when compared with the Industry's two best 1.2ltr engines, i.e., Maruti's 1.2ltr K series and the hyundai's 1.2ltr Kappa. Other than that, the dragon petrol is a great engine, and definitely not an disappointment as you might have come to suspect after reading the reviews. In fact, when revved hard, and driven enthusiastically, the engine rewards with pretty decent performance. Combined with the safety net of ABS, ESP and TCS, which does kick in when required, the car gives the confidence to throw it into those corners and rough surfaces (specific to freestyle). With the fatter 195mm tyres and lower GC, I am pretty sure Aspire will be a good handler. Coming to the fuel efficiency side, the dragon 1.2 ltr gives noticeably better FE figures when compared with i20's 1.2 ltr kappa on similar road conditions. The review has been immaculate and the eye for details are praiseworthy. Potential buyers will be hugely benefited by such detailed note. I as a potential buyer, was kind of waiting for the review. 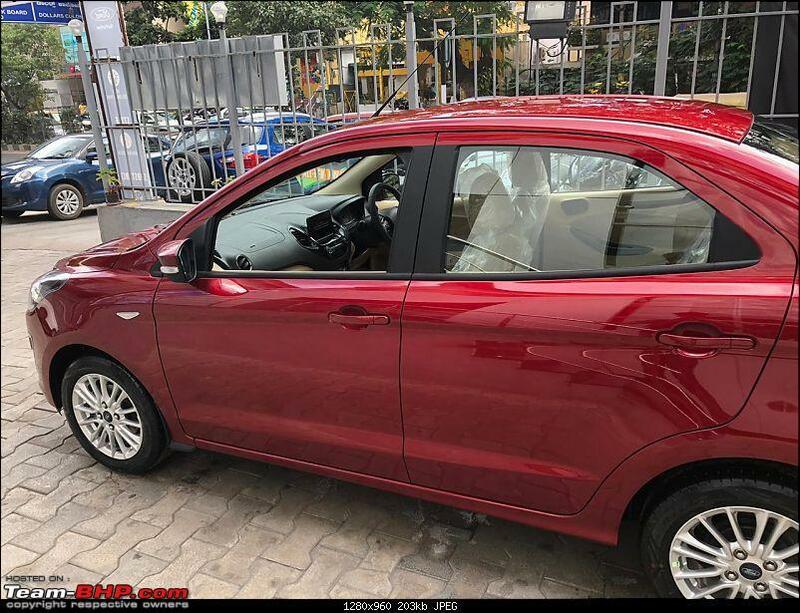 I have taken the Test Drive of Ford Aspire 2018 on 11th Nov 2018. Drove the Diesel Titanium and 1.2L Petrol version on the same day. The Diesel was a power horse and the braking was much better than previous Aspire. In fact, I found that the braking is better than Dzire. My one question is, With the BS-6 regulations kicking in 2020, will Ford Aspire be able to retain this diesel engine in 2020 and beyond ? Is this engine compliant to BS VI norms or this engine will required to undergo some modifications to remain compliant ? I felt the same when I went to test drive i20 and freestyle with a friend of mine. While the motor on i20 was very silent, it felt lethargic. I had to constantly change gears to keep it in power band. To me, barring refinement, Dragon 1.2 felt better in every other aspect. The India based 1.5 diesel mill of Ford will be BS VI compliant with minor changes to hardware such as EGR and cat con. Every automaker is bound to make their engines BS VI compliant by 2020. Indeed the same engine with those HW changes is already Eu 6.2 compliant in the Europe. Having said that, if you’re in the market to buy an Aspire now, its BS VI compliance should nowhere stand in the way as it comes to force in 2020 and is applicable for cars rolling out of production lines from that timeframe onwards. Without even test driving myself, I can confidently say - Body roll and cornering ability is good enough for 20kmpl mileage kind of driving. LOL I was referring to city driving. My daily city drive would be 60+ kms and alternate weekends 100+ highway. When on highway I dont consider about fuel economy but i do consider drive quality. Thanks Sir for the prompt reply. I am currently an owner of Ritz Diesel (Ran for 1.12 Lakh Kms for 6 years and still kicking) and a Maruti Alto (Ran for 9 years with 36,000 kms and of moderate health). Therefore I am due for replacement of both. Now , I am kind of torn between Aspire Diesel and Dzire petrol models. I liked the Diesel of Aspire and the sheer power in its belt is awesome. At the same time, the Dzire petrol has been good too. With the BS VI compliance kicking in 2020, I was thinking to retain the Ritz diesel and run till 2020 (in case the Ritz Diesel can survive till 1.7 lakh kms). Hence I went for Glow Plugs replacement, EGR maintenance and timing chain replacement for the Ritz Diesel. The reason I am trying to elongate the life of Ritz Diesel is to allow me to wait for 2 more years so that my next Diesel car is a BS VI compliant model. That is not possible with Maruti since the Fiat Diesel engines will be retired and new BS VI engines will rolled out. But for Aspire, if the existing Diesel mills are going to be used with minor modifications to fit into BS VI norms, that means, the existing engines will Not be retired , rather it will be enhanced. So Aspire Diesel mills will be the choice since this engine ensures continuity to post 2020 era as well. Hence my question. My current plan is to sell the Maruti Alto and Buy the Maruti Dzire Petrol. Then wait for 2 years to get hold of this Aspire Diesel, which by that time will bring the BS VI compliant engines. Lovely review, one that I was looking forward to. Lot of brainstorming on what was our next family car that would stay for years to come, an upgrade from our Accent which still has a sheer feel that personally I couldn't get it on the sedans I've driven, unfortunately. There is something to this car that just is missing with the sedans out there. The Aspire with its lovely features, price point, and the looks especially the Diesel was a sweet spot for us, but again the Xcent and Tigot did play spoil sport. Now, we've postponed the decision altogether. Nevertheless, nicely done fellas. Makes sense. 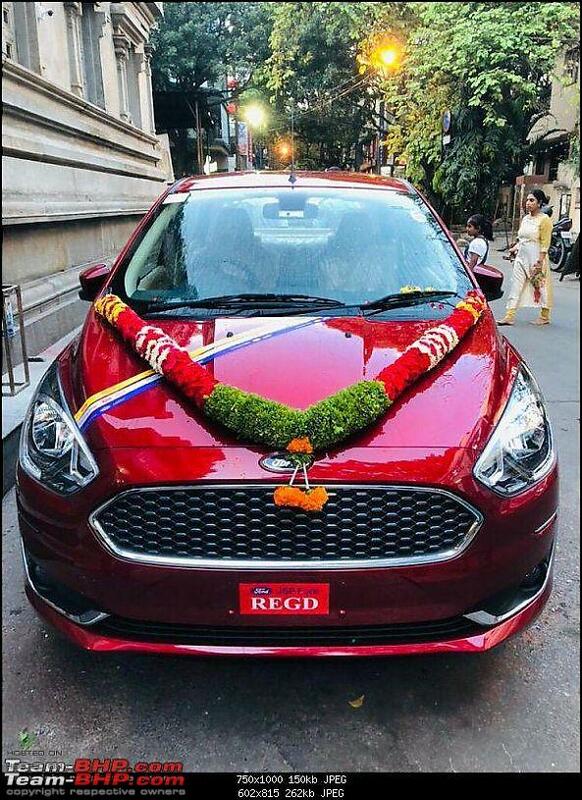 With the new venture with Mahindra, I can only guess Ford bringing in additional power train / EV options to this platform but not jeopardise this engine which is the bread and butter of its B car lineup. So you can gladly sit back and wait for it’s BS VI version if you wish so. Nice car & a meaningful update. When are you testing the Auto? Any views on the ground clearance? (Esp vis a vis the Freestyle and the older Fords). Any chance of an A/B comparison with the Freestyle, and the EcoSport? Excellent review of the Aspire Facelift, Blackwasp and GTO Sir. Everything that one needs to know about the facelifted Aspire is in here, incredible attention to detail! 1) EXCELLENT NVH. The car is very well insulated and little or no engine noise enters the cabin. It's a different story outside the car though, diesel clatter is evident on the outside. 2) Very well tuned suspension. Ride quality is excellent over all types of roads. The suspension is very absorbent. 3) The SYNC 3 is very easy to use and has zero lag. Pairing the phone to Bluetooth was a breeze and audio seems decent too. 4) The aspire is down on quality when compared to the Ecosport, but much better than a few cars in the competition. Having had two Fiesta 1.6's and one Ikon in the family previously, I can confidently say the Aspires build quality is nowhere near to the older Fords. 5) The 1.5 TDCI has no turbo lag and is almost as linear as a petrol to drive in the city. Can't comment on high speeds yet, as the car is not even a day old and hasn't crossed 60 kmp/h. 6) The car had covered 20 km at the time of delivery and currently stands at 35 km. Fuel economy is hovering around the 9.5 km/l mark. 7) The headlights are adequate for city use (low beam). Yet to test it out on the highway. 8) The doors auto lock at 15 kmp/h. The mirrors do not fold in during lock/unlock, although electric folding is provided. 9) The car came shod with 195/55 Apollo Alnacs. Spare tyre isn't an alloy. The car is currently on a 1000 km road trip , the odometer reading is close to 900 km, and the fuel economy is hovering around the 20.5 km/l mark, with speeds being maintained under 80 km/h. 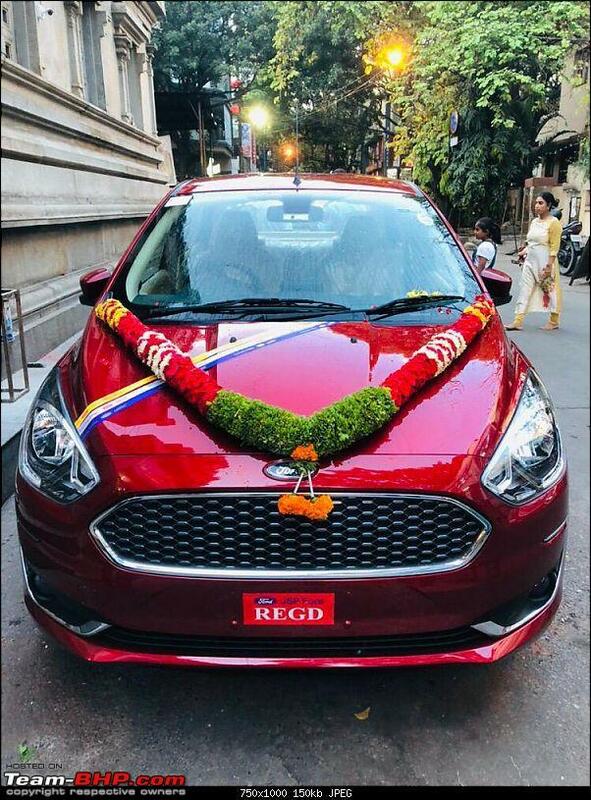 This is due to the use of lighter steel by Ford. The Aspire's build quality is down when compared to the older Fords, and even the Ecosport. The boot lid especially, feels VERY light. The Aspire has scored 3 stars in the Global NCAP test. Since the Aspire and Freestyle are built using the same platform (and material), and also weigh the same, we can expect the Freestyle to score 3 stars too. Last edited by Prathiiik : 30th November 2018 at 21:36. Correct me if I am wrong but if you may please look at this image closely, it is 30psi all around for single driver, where as 35psi all around for full load (5 people + boot full of luggage). It is not 30 front and 35 rear. This is same as older Aspire. Even with 14" tyre setup, the similar load based pressure instructions are given. An amazing review with great attention to detail. The handling of the car has improved on the Titanium models but I found it similar to the outgoing model on the Trend model. Maybe the upsized tyre size is the reason for the matured and confidence inspiring handling on the higher trims of the car. I have a belief that there are no major mechanical changes in the car, especially in the diesel models. The clutch is also similar to the outgoing car. I don't think anyone will find it too difficult to drive this car in heavy traffic. I was stuck in a massive jam in Roorkee once but my knee did not complaint of any pain or discomfort. The 1.5L TDCi is amazing and driving the car in city is effortless. Out on the highway, you will never feel any lack of power and the engine pulls the car with great ease irrespective of the gear or the speed of the vehicle. Adding to this is the amazing Fuel Efficiency which is offered by this motor. I have managed to extract 28 kmpl with an avg speed of 63kmph on a 726km journey. In the city, I manage to extract 18-20kmpl with AC on always. The AC is best is the segment and chills the cabin in no time. The lack of rear AC vents is never felt, even during the summer of Delhi with temperature as high as 45-47°C. Despite the fact that the build quality is not similar to the older Fords, but it is still one of the best when compared to the cars of other brands. Once, I rear ended a Ciaz due to some unavoidable circumstances and when I saw the Ciaz, I was sure that my car too would have suffered great loss but when I came out and saw my car, I was surprised to see literally no damage to the car except one scratch on the bumper, which was later cleared using Coalgate. Also, I would like to share that the paint quality of the car is also wonderful. Mostly it is used in the city and this car has handled the abuse by the Delhi NCR traffic amazingly well. There is absolutely no doubt about the overall built quality of the car. 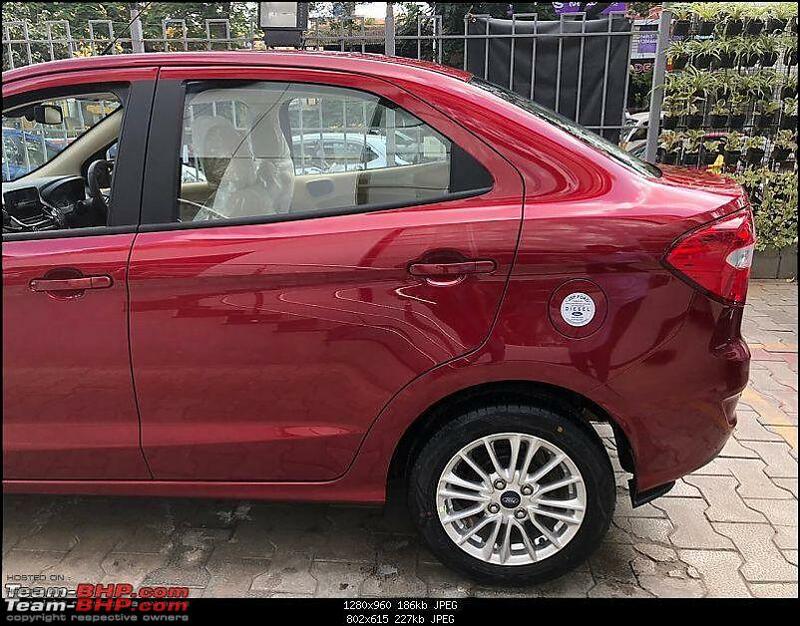 On the long drives, non of the passengers have complained about any kind of discomfort at the rear and everyone praised the space inside the car. I would also like to share one observation. If you have a laid-back driving position, you may find the lumbar support to be lacking. I would suggest everyone to add some lumbar support when installing the seat covers. There are some blind spots in the car. The A pillars restrict visibility but I got adjusted to it with time. The rear visibility is also not so great. The gearbox is notchy but accurate. Be gentle with it and you will not find it difficult to use. The moment you use force, the gear shifting will not be as smooth as you desire it to be. I am a musician myself and a huge audiophile. The music system is decent and the overall sound quality is good. One more observation, during heavy bass music, the door pads have a high vibration. The headlights are not satisfactory for highway use. The low beam is amazing but the high beam is not up to the mark. The hotspot of the light throw is a little above than what you would want and there is very light falling behind the hotspot, due to which driving it when there is oncoming traffic becomes difficult at night. It is just an aesthetic observation, but the car looks amazing when there are black tints on the windows . However this is applicable only for white and red colour. 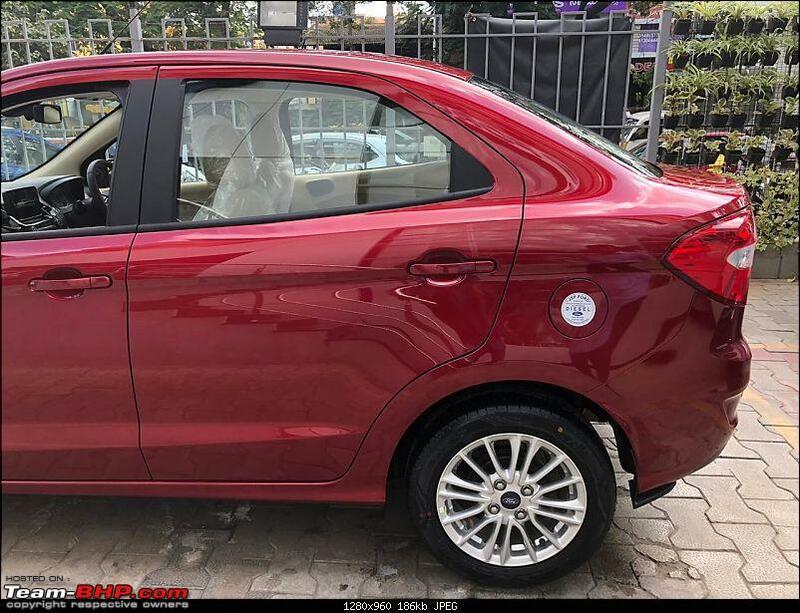 To conclude, I would just like to say that I found it to be the best Compact Sedan, and with this facelift, I hope it will get wonderful sales. If anyone wants to buy a diesel car, I think that there are very few cars which can directly give competition to the Aspire and the Freestyle below INR 10-11lacs. All times are GMT +5.5. The time now is 14:09.